Tacos are the perfect food — uniquely versatile and delicious for breakfast, lunch, dinner…even dessert. 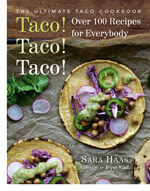 Sara Haas, our friend, registered dietitian, and professional chef, has just released her latest book Taco! Taco! Taco! The book features 100 savory and sweet taco recipes that are as easy to prepare as they are to love. You’ll find plenty of delicious options not only for omnivores, but for vegetarians and vegans alike. 3. Tell your friends to visit the page and vote for your photo. Eat some tacos, have some fun, and you could win some goodies! Make one (or more!!) of the recipes and send in your photo(s)! We’d love to see what these recipes look like on your table, and we think you’d look great toting around our canvas bag.